George Henry Martin is an English record producer, arranger, composer and musician. He is sometimes referred to as "the Fifth Beatle"— a title that he often describes as "nonsense," but the fact remains that he served as producer on all but one of The Beatles' original albums. He is considered one of the greatest record producers of all time, with 30 number one hit singles in the UK and 23 number one hits in the USA. As head of EMI's Parlophone Records in London, Martin signed the Beatles to their first-ever recording contract in 1962 and went on to produce all their records--both with Parlophone and, later, at his own AIR (Associated Independent Recording) studios--throughout the band's seven years together. Martin's recording savvy, along with his abilities as an arranger and scorer, helped shape the Beatles' music in a way that highlighted their immense songwriting and performing talents. At the same time, Martin produced other successful Parlophone pop artists, including Gerry and the Pacemakers, Cilla Black, and Billy J. Kramer, transforming small Parlophone into a pop-hit machine during the 1960s. In Martin's biggest year--1963--records he produced were number one on British pop charts for a record 37 weeks of the entire year. Today, still respected as one of the foremost producers in the recording industry, Martin works out of his two AIR studios, located in London and on the Caribbean island of Montserrat. Martin became a record producer by way of his own background in music. After serving during the Second World War with the British Fleet Air Arm, he attended London's Guildhall School of Music for three years, during which time he studied music composition and classical music orchestration in addition to his studying the piano and oboe. In 1950, he was hired as the assistant to Oscar Preuss, then head of Parlophone Records, and was charged with overseeing the label's classical record repertoire. Because Parlophone was such a small company, Martin was able to quickly gather much experience and responsibility. He eventually began working with the label's established jazz artists, and produced several bestselling records by Scottish dance bands. Considered something of a maverick, Martin sought out new and untapped markets for the label and produced a string of hit comedy records by such artists as Peter Ustinov, Peter Sellers, and Bernard Cribbins. In 1955, at the age of 29, he was named head of Parlophone, and became one of the youngest persons ever to be put in charge of a record label. As head of Parlophone, Martin continued to maintain the label as a producer of humorous records, but he also wanted to acquire successful pop artists. When he was approached by Beatles' manager Brian Epstein in 1962, the group had been turned down by every major record label. Convinced, however, that the Beatles had all the right pop elements--infectious songs, winning personalities, and good group voices--Martin signed them to a contract and set out to record them in EMI's Abbey Road studios. That same year, the Beatles' first single, "Love Me Do," backed on the flip side by "P.S. I Love You," reached number seventeen on the British charts, and was followed with "Please Please Me," which went all the way to Number 1. The craze for the Beatles--dubbed Beatlemania by the press--began in England and in little more than a year the "Fab Four" would similarly overtake the United States with the single "I Want to Hold Your Hand." As Martin recalled in his 1979 autobiography, All You Need Is Ears, "suddenly the whole thing snowballed and mushroomed and any other mixed metaphor you care to think of. From that moment, we simply never stood still." The Beatles's first album, Please Please Me, was recorded in the span of one day and, like virtually every Beatles recording which followed, soared to Number 1 on the charts. Martin's primary role as producer of the Beatles' early records was to direct recording sessions and oversee the group's pop sound. Under his guidance, for example, "Please Please Me" became an upbeat number instead of the ballad originally intended by the Beatles, while "Can't Buy Me Love," began distinctively on the chorus segment of the lyric. His producer role diversified with the Beatles' song "Yesterday," as orchestration by Martin was used for the first time, and--drawing upon his music training--he became both the arranger and scorer of the Beatles' music. Martin's classical influence can be heard in the string quartet of "Yesterday," in addition to the orchestral segments supporting "Strawberry Fields" and "Eleanor Rigby." Martin's scoring and composition capabilities would eventually lead to his work as scoring films for a handful of movies in the 1960s and 1970s, including the Beatles' Yellow Submarine. In 1965 Martin's musical direction of the Beatles' A Hard Day's Night earned him an Academy Award nomination for best musical direction in a film. As the Beatles' music became more sophisticated, and as technological developments such as stereo allowed for wider-ranging production opportunities, Martin became an important link between the Beatles' musical concepts and their actual recordings. The crowning achievement of their association came in 1967 with the lavishly-produced Sgt. Pepper's Lonely Hearts Club Band, which is considered by many to be the hallmark of the "concept album" in pop music. In All You Need Is Ears, Martin described Sgt. Pepper as "the watershed which changed the recording art from something that merely made amusing sounds into something which will stand the test of time as a valid art from." Regarding the Beatles' successful career as a whole, Martin notes the contributions of each member, and his own, as essential--but he singles out songwriters John Lennon and Paul McCartney as the leading talents. In his autobiography, Martin calls Lennon and McCartney "two tunesmiths of genius.... [who] simply couldn't understand the need for complication." From 1965 until the Beatles' breakup, Martin produced the group from his AIR studios in London, which he and several other EMI record executives formed after leaving the company over wage and royalty disputes. In 1979, Martin opened an additional AIR studio in the British protectorate of Montserrat in the Caribbean. Situated on a thirty-acre site atop a 500-foot ridge, AIR Montserrat is considered one of the state-of-the-art recording studios in the industry. Martin has produced several artists there, including ex-Beatle Paul McCartney and his Tug of War album. Among the other prominent artists that Martin has produced at AIR are Jeff Beck, Kenny Rogers, Ella Fitzgerald, Neil Sedaka, and the group America. While technological advancements in the 1980s such as digital recording and multi-track machines have made it easier for producers to make records, it hasn't necessarily resulted in better recordings, according to Martin. He told Susan Borley in a 1987 Audio profile that "better music's got to come from the heart, it's got to come from creativity. I don't think it's necessary to have the extremes of technology. It's like sitting in a comfortable chair, you know, instead of sitting in a hard-back. It doesn't make you sit any fitter, probably less." Asked whether he would rather go back to the older days with less sophisticated equipment, as in the Beatles' early recordings, he told Borley: "The only thing I yearn for is recordings that are more spontaneous. Today everything is so clinically controlled, and everything is so meticulously accurate.... This worries me because I think the heart is going, and I'd like to get back to humanity and mistakes." In 2001, Martin released Produced by George Martin: 50 Years In Recording, a six-CD retrospective of his entire studio career, and in 2002, Martin launched Playback, his limited-edition illustrated autobiography, published by Genesis Publications. 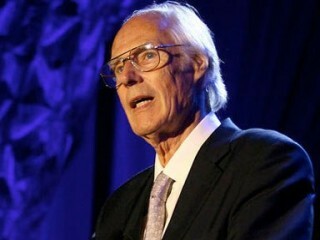 View the full website biography of George Martin.